Soft Cover, 326 pages, 6x9. Hieronymus applies his extensive research to explain the nature of hops, their origins and how brewers maximize their positive attributes throughout the brewing process. For the Love of Hops covers�the basics of hop chemistry, then examines the important role farmers play and how brewers can best choose the hops they need. 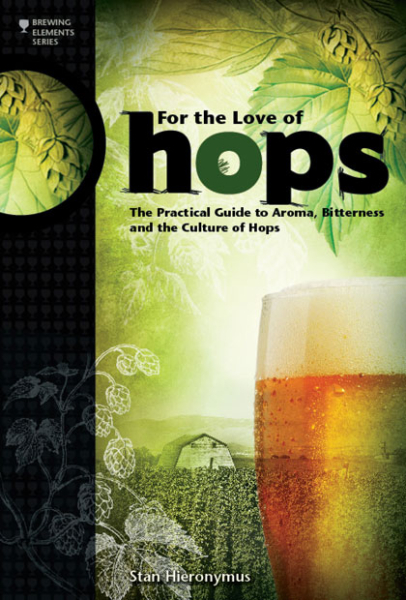 �It includes fundamental information about and descriptions of more than 100 hop varieties, along with 16 recipes from around the world, including from top U.S. craft brewers. Hieronymus also explores hop quality and utilization, with an entire chapter devoted to dry hopping. Throughout, the author's research and accessible writing style educate the reader on the rich history of hops and their development into an essential ingredient in beer. "This book is an amazing compendium on the hop, written at a level of detail that will captivate historians, chemists and brewers alike. Stan Hieronymus� exhaustive research traces the history and evolution of many traditional and recently developed cultivars embraced and supported by craft brewers, and reveals a great deal about the dynamics driving the industry�. This book is technically sound, very well researched and footnoted, and digs into the use and history of hops in a deep and relevant way." --From the Foreward, by Ken Grossman, Sierra Nevada Brewing Co.